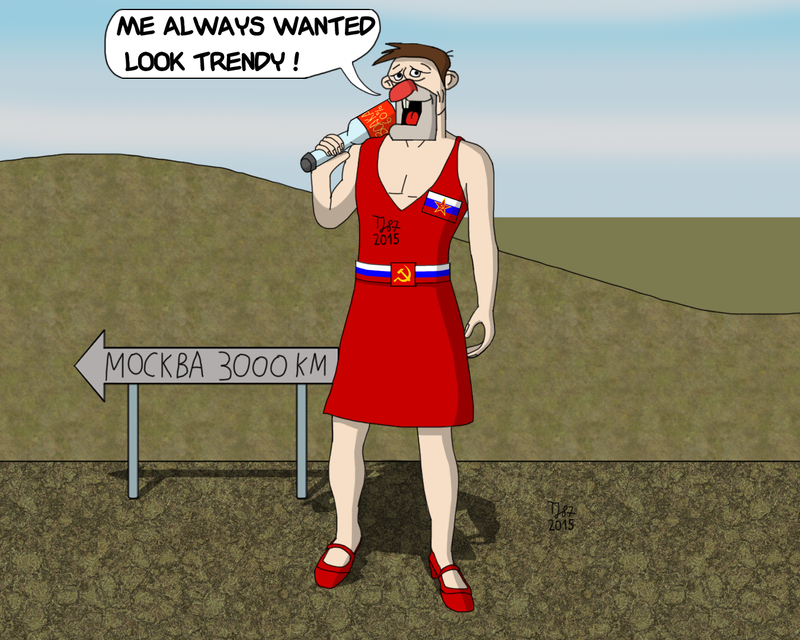 Follow-up of http://www.fanart-central.net/pictures/user/TeeJay87/844345/Fashion-Folly - Vassily's socialist revolution in fashion has reached the level, when our "Pride of the Working Class" has finally joined feminazi movement. Nobody knows, where did he get his new red dress, the only certain part of the story is that originally it was plain female outfit. Vassily just sewn emblem of Russian communists in front and added matching (in his opinion) belt. The area around him is supposed to be Siberian tundra north from Yakutsk - not covered in snow, because it's middle of summer. This picture is based on screencap from Fallout 4 http://vignette1.wikia.nocookie.net/fallout/images/4/48/FO4_Red_Dress.png/revision/latest?cb=2015... - when I saw the bloke depicted there, he reminded me Vassily for some reason. Thus I developed the concept. So far away from Москва! Ministry of Inner Affairs in Moscow founded Vassily such trip with one-way ticket to Yakutsk. Pretty Василиса (Vassilisa) wanted a necklace to complement her beautiful red dress. She wanted to look like a princess. She is not very smart, and really easy to be duped. So, a cunning civil servant from the Ministry of Inner Affairs in Moscow told her there were lots of diamonds in Yakutsk. "​So many diamonds, they are growing on trees. But hush, hush, it is a secret. But since you are a person of great valor, we are very glad to offer you a free ticket to Yakutsk. Enjoy your stay there! " It is like apples, but it is smaller and more brilliant.